That looks like an awesome slip 'n slide!! Do you know what it's called or where I might find one??? Macy got it for her birthday, but I just happened to see them at Target yesterday. 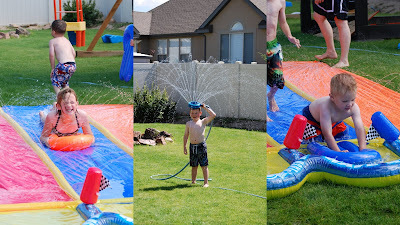 Slip n slides are the best! I really want one for myself! You have such cute, happy kids. I just finished publishing my latest post and then checked your blog. They are eerily similar. We must really want summer! and we have forcasted thunderstorms tomorrow. but yes, yesterday was gorgeous. sigh.